There was a delay on one of the underground lines in Berlin a few weeks ago because a homeless man had fallen asleep on the tracks. Security personnel rushed to the scene and the man was woken up. Bewildered, he growled at the passengers staring at him. He was escorted off the platform but it all took time. There was a short delay before service resumed. My jaw dropped. I couldn’t believe what I was hearing. First of all, the transport system in Berlin is the single best I have ever encountered. And second, here were two tiny German girls complaining about bad service in language so adult and earnest that it was comical. This, I thought is the difference between the Germans and the Irish. As our economy wilts and theirs prospers, it’s worth examining what makes the Germans German and the Irish Irish. I’m in a rather convenient position to do so, being half of each. Complaining in Germany, as in Ireland is a national hobby. The difference here is that complaints are taken seriously. The reason that complaints are taken seriously is that responsibility is too. When you go to a ticket vendor or to buy a hot dog, you’re served with the same level of attention as you are in a bank or a lawyer’s office. Some time ago, I was working on a story about low wage workers and got talking to a middle-aged woman selling hot dogs on the street. “I take my job seriously,” she told me, after she spoke perfect English while serving some American tourists. “I want people to enjoy their food.” She was earning about six euro an hour and was finding it hard to make ends meet. Sincerity too is an integral part of the German mindset. If you say “We must meet up for a coffee. I’ll give you a call in the next couple of days,” it means that you will certainly arrange a date within three working days. Shortly after I moved into my apartment, I made my flatmate dinner. It was vegetarian Shephard’s Pie and I was worried that it hadn’t turned out well. As we sat down to eat it, he took a few mouthfuls and said nothing. I was nervous. Perhaps it wasn’t to his taste. I waited for a while and then tentatively asked whether the food was alright. “Then why didn’t you say anything?” I cried. 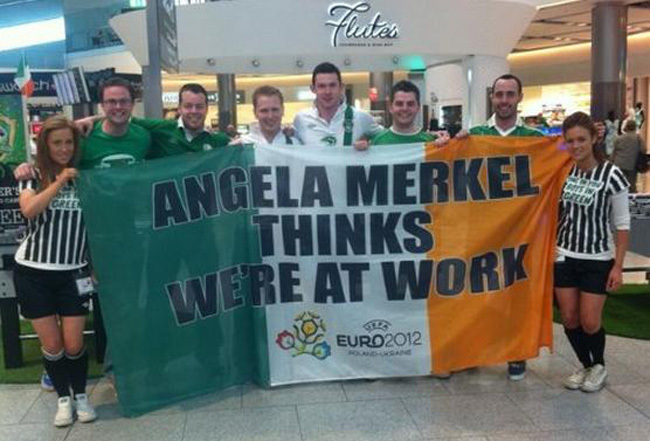 While the Germans are responsible, reliable and sincere, the Irish are compassionate, humorous and wily. Before I moved to Berlin, my boyfriend made me a mix tape which included two anthems to remind me of home. One of them is the speech Enda Kenny made to welcome Barack Obama to the country and the other is the lament, with mandolin accompaniment, performed by Joe Duffy following Thiery Henri’s handball in 2009, which crushed Ireland’s dream of qualifying for the World Cup. The latter is ridiculous and hilarious and features lines such as “Will You be Out of Favour To Sell Gillette Razors?” and “It’s a pity for the South African nation without us at their world celebration.” Enda’s speech on the other hand, is so full of passion and pride that it’s hard not to feel a pang of affection for the little nation, which despite falling to pieces, has still managed to maintain a healthy dose of national pride. While the Irish might champion mediocrity, they do it with charm. Ireland is like the child in the psychological experiment that gobbled up the single marshmallow, despite knowing that if it had waited, it would have received two. Germany is the child that waits for the second marshmallow but wonders whether, by the same principle, it would make more sense to continue to wait rather than to enjoy the two already gained. The Irish are wily and endearingly naive. We wouldn’t quite call ourselves dishonest but we’d settle on being creative with the truth: the stuff of brown envelopes, dodgy property deals, shifty politicians and the Catholic Church. On the other hand, it’s also the kind of opportunistic cleverness that bagged Enda a meeting with the Chinese Vice President last February, made Jedward into national icons and allows some to hold fast to the belief that we really, really, really can win the Euros. If we could learn accountability and responsibility from the Germans and teach them to kick back and remember that everything – probably will be grand in the end – we’d both be better off. Instead, they’ll be bailing us out for decades and we’ll be telling jokes to numb the pain. This entry was posted in Uncategorized and tagged Culture, Enda Kenny, Euro Crisis, Europe, European identity, eurozone, Germany, Ireland, Journalist, Kate Ferguson, Life, Merkel, National Characteristics, Society, Stereotypes by Kate Katharina. Bookmark the permalink. Really enjoyed this piece. Your blog alerts in my inbox really brighten up my day! I love your take on the world around you, so observant and questioning. The thought of the Germans waiting for marshmallows really made me laugh! Thank you so much, Prasina! You have brightened up my evening in turn! Sometimes the writing comes and other times, the words get stuck in a rut and it’s so wonderfully worth the slog when somebody says that they enjoy it! I wonder whether, in a third possibility, Germans would consider marshmallows worth waiting for at al! Brilliant. Genuinely one of your best! Ah thanks Gorgebag! “You’re biased..and DESPITE that….” I hope you like the mix tape inclusion! I have goggle eyes from staring at a screen now and my banana chips are almost all gone! You have really captured the essence of the two nations brilliantly. Maybe it takes a mongrel like yourself to describe it so succinctly. However, Germany is a big country, and the mentality in Southern Germany is a bit different from that in Berlin. Of course you’re right. I’ve met wonderful and helpful people here too. All of this is really subjective and I’m gathering new experiences all the time. One thing that surprised me is that now that I’m here, I feel more German than Irish. Usually moving to a new place would evoke the opposite feeling. Don’t underestimate the value of seeing the bigger picture! Im the kind of person that always notices the sane piece of gum on a pavement but couldnt tell you what area of the city Im in or what direction is north!